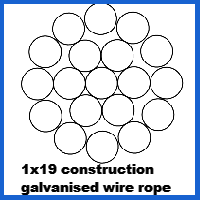 Harness the heavy-duty features of galvanised rope with our 1×19 construction range. It comes in a host of different diameters, with the 9mm 1×19 Galvanised Wire Rope example sure to surprise you thanks to its shocking strength and durability. As there are lots of wire rope options out there, drilling down into the details of what makes our 9mm 1×19 construction rope tick is essential to avoid confusion. Firstly the diameter allows for load capacities of slightly under 8.5 tonnes to be reached. There are heavier duty products in this range, but in the right setting this rope should be more than capable of completing lifting tasks safely. Secondly the corrosion-countering layer of zinc that is added during the galvanisation process prevents the ingress of moisture and leaves the rope liberated from the threat of rusting. Rather than selecting this galvanised rope and having to adapt it with fittings and tools at the expense of your own time and resources, why not ask Rope Services Direct to do this for you? We are masters of making bespoke assemblies using the rope we manufacture, catering to customers across industries including architecture, waste management, shipping, automotive production and beyond. Get a rapid response to any query about wire rope you have by calling 01384 78004 or filling out the form on our contacts page so that we can reply via email. Our experienced, approachable staff are here to assist customers of all kinds. 9mm 1x19 Galvanised Wire Rope Overall rating: 5 out of 5 based on 6 reviews.